The Embassy Suites Hotel Baltimore North offers 223 two room suites for your comfort whether you are traveling on business or pleasure. Each suite overlooks the beautiful garden atrium and provides a tranquil setting as the waterfalls and park like atmosphere will relax you after a busy day. 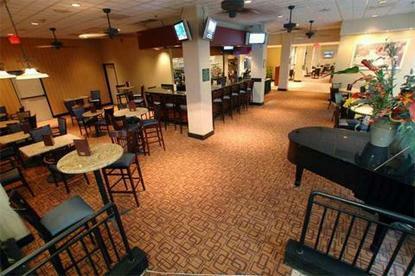 Whether you are taking in a Orioles Baseball Game, visiting the Inner Harbor or attending a convention or business meeting the Embassy Suites Baltimore North provides a comfortable, relaxing and friendly atmosphere. The Embassy Suites Baltimore North offers two room suites, each with two telephones, two televisions, iron and ironing board, hair dryers and Data ports. Complimentary full cooked-to-order breakfast is served in the morning and a manager's reception in the evening. You can start your day with a complimentary newspaper, a swim in the indoor pool, a workout in the health club or total relaxation in the sauna, Jacuzzi or steam room. A state-of-the-art (self - service) business center, meeting facilities and catering space is also available. For business luncheons and dinners, family meals or a light snack Lafitte's And All That Jazz is open from 11am until 10pm and 12 midnight respectively. If in-suite dining is your desire, we offer a full menu and service until 10pm.